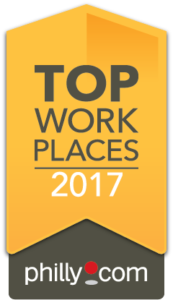 NORRISTOWN, Pa. – March 28, 2017 – MRO, a leader in the secure, compliant and efficient exchange of Protected Health Information (PHI), announced today that it is on the list of Philly.com’s 2017 Top Workplaces. Out of 14,000 companies in the Philadelphia area, 125 companies made this prestigious list; MRO was ranked No. 34 of best midsize companies. Top Workplaces lists are based solely on results of an employee feedback survey administered by WorkplaceDynamics, LLC, a leading research firm. To see the full 2017 Top Workplaces lists, visit Philly.com. MRO empowers healthcare organizations with proven, enterprise-wide solutions for the secure, compliant and efficient exchange of Protected Health Information (PHI). These solutions include a suite of PHI disclosure management services comprised of Release of Information, government and commercial payer audit management and accounting of disclosures. MRO’s technology-driven services reduce the risk of improper disclosure of PHI, ensure unmatched accuracy and enhance turnaround times. MRO additionally supports its clients’ current and future initiatives, including interoperability, meaningful use and health information exchange. To learn more, visit www.mrocorp.com.